DEMOCRATS ARE OUTRAGED that conservatives have been showing up at town-hall meetings with members of Congress to noisily protest the health-care "reform" bills pending on Capitol Hill. In a statement last week, the Democratic National Committee spokesman slammed "Republicans and their allied groups," charging them with "inciting angry mobs of . . . rabid right-wing extremists . . . to disrupt thoughtful discussions about the future of health care in America." A new DNC video, meanwhile, blasts "the right wing extremist Republican base" and says that GOP leaders "called out the mob." Now, there is no excuse for the ugly rhetoric and behavior of a few of these protesters, like the ones in Maryland who hanged Representative Frank Kratovil in effigy, or the Massachusetts voter who compared Representative James McGovern to the Nazi doctor Josef Mengele. It was disgusting when left-wingers spewed such venom during the Bush years. It is disgusting when right-wingers do so today. But surely Democrats don't object to energetic grassroots activism, not after they spent so much of 2008 extolling the virtues of "community organizing." And surely they aren't offended by citizens going toe to toe with those they disagree with politically, not after Barack Obama urged his followers last year to remonstrate with friends and neighbors "whether they are independent or whether they are Republican. 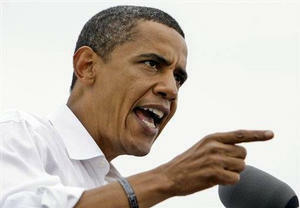 I want you to argue with them and get in their face," Obama said then. Democrats may differ with their opponents on health care, but they can hardly fault them for taking a page from the Obama political playbook. SONIA SOTOMAYOR is to be congratulated on her confirmation as a Supreme Court justice, but must we have the constant focus on her Hispanic ethnicity? In one story after another last week, the news media -- from The New York Times to Fox News to Bloomberg to CNN -- trumpeted the fact that Sotomayor will be the court's first Hispanic; President Obama hailed her elevation as "breaking yet another barrier and moving us yet another step closer to a more perfect union." But the way to a more perfect union is not to treat ethnicity as profoundly significant, but as fundamentally insignificant. The confirmation of the nation's first Hispanic high court justice (if she is -- a case can be made for former Justice Benjamin Cardozo, a descendant of immigrants from Spain and Portugal) is understandably gratifying to Hispanic Americans. But it should be as irrelevant to most of us as the confirmation of the first Scandinavian or Slavic or Chinese justice would be. In her confirmation hearings, Sotomayor repudiated her former claims about how a "wise Latina" would approach the law, and vowed never to let ethnic or racial considerations sway her judgment. All Americans should live by that standard. Ethnicity does not determine a person's character or values or politics. It is a biographical detail -- interesting, perhaps, but not of the essence. "Our Constitution is color-blind," Justice John Marshall Harlan wrote in 1896. We should all be. ON THE REPUBLICAN FRINGE, a small but vocal group of cranks have been insisting, against all reason and evidence, that Obama wasn't born an American citizen and is therefore ineligible to be president. This is a crazy theory, and Republicans who flog it are an embarrassment to their party. But no party is without its fever-swamp delusions. In 2007, a national survey found that 35 percent of Democrats believed that George W. Bush was tipped off to the 9/11 terrorist attacks in advance, and another 26 percent weren't sure. Even Howard Dean, running for president, praised that lunacy without irony as a "most interesting theory." And countless Democrats hailed Michael Moore's "Fahrenheit 9/11," which accused the Bush family of being in cahoots with Osama bin Laden. Equally deranged were the Sarah Palin-haters who maintained that Trig, Palin's baby boy, was not really her child, and circulated "evidence" to prove that 17-year-old Bristol Palin was the true mother. And there are those who believe to this day that Ronald Reagan's presidential campaign in 1980 conspired with the Khomeini regime in Iran to keep American hostages from being released until after the Nov. 4 election. Crackpots can be found on both sides of the political divide. What should matter to voters is not whether nutty views exist, but whether party leaders firmly reject them -- or sustain them with deference and respect.